permaculture design vt Archives | Zachary Berger Associates, Ltd.
Hopefully you’ve had some time to catch up on what permaculture is all about and learn how ZBA is pursuing a Permaculture Design Certification. In the second module, Social Permaculture: Building Community & Relationships, we bring permaculture design principles from the landscape and into the social realm of our communities. So what is social permaculture? Simply put, it’s the way in which humans behave. The underlying theory being that if we can identify beneficial human behavioral patterns and design social constructs that mimic this behavior, we can begin building communities that thrive. All this, with a collaborative mindset that the largest hurdle are the individuals within the community. This part of the design certificate was facilitated by Traci Bisson, an active community member. Bisson has recently devoted her life to the needs of her local community. Traci earned a science degree from UNH, but it’s the work in the community that may be most impressive. She serves as Chair of the Barrington Library, established a learning garden for the local elementary school and donates several hundred pounds of food to the town pantry each year. The curriculum consisted of a diversified participation effort. This included natural journaling, community interactions and of course, textbook readings. 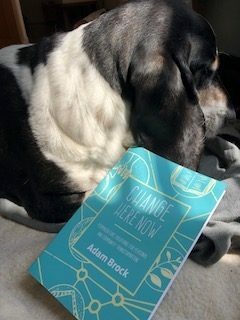 Change Here Now by Adam Brock was a great explanation of this complicated concept. We’re looking forward to injecting his relevant and intriguing patterns into our daily lives. The most challenging aspect to Social Permaculture involved interacting in the community. Community leader interviews and board meetings filled the agenda. Our community is busy and asks that we be patient. Different boards meet on varying times of the month, so it’s important to pay close attention to scheduling. Why is community important to us? Community allows us to feel that we belong and that its actions are something we identify with. When strong relationships are built, we’re better prepared to respond to threats. Thus, our community is stronger. The easiest way to become involved and make a difference in your community is by doing something that interests you. We do our best by maintaining trails for AMC and volunteering for Stowe Land Trust. It’s what we know and what we care about. Lastly, we thought we’d leave you with a few examples of social permaculture in action. La Cite Ecologique – Colebrook, NH.